I thought Far Cry 3 was the one. As the game opens up, you’re treated to a party montage, then abruptly jump cut into a makeshift wooden cage where your character is held captive. You’re taunted, mentally abused, and helpless. A friend captured with you manages to squeeze out of the rope bindings and escape. In the midst of remarkably fluid and varied animation, you try to make an escape. Your friend is killed in a frantic sequence that leads into a linear foot chase. I’m in awe. Shame there’s more to the game afterwards. Open world games and me have never clicked, mostly for the same reasons. Try as I might, Grand Theft Auto, Skyrim, Red Dead Redemption, and the Far Cry series lose me almost immediately. I understand where the appeal comes from, the sheer variety of things to do, unexpected happenings, exploration thrills, and other elements come together. I adore watching videos from people who pull off ridiculous stunts or take a hilarious approach. 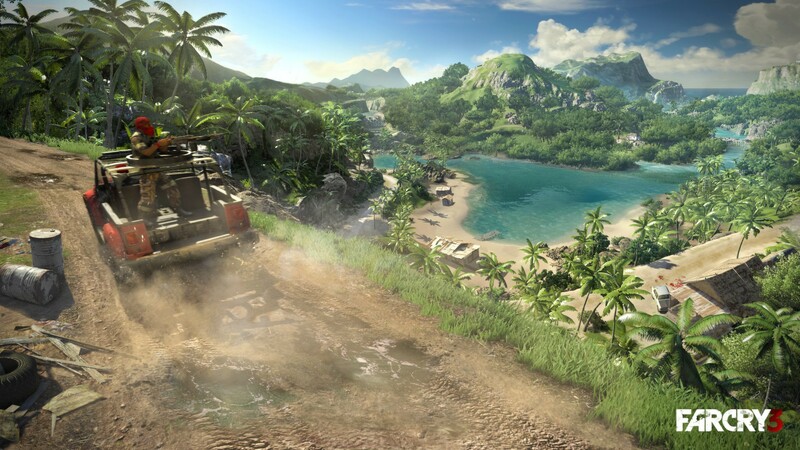 But, here’s Far Cry 3. I take an early mission to meet up with a doctor. It’s on another island across a body of water. I don’t have a map unlocked yet for that section, so I’m driving in blind, looking for bridge. As I travel, I’m interrupted by a car full of thugs who begin chasing me. In a panic – and in attempt to move the narrative forward – I end up going off a cliff. Somehow, the car is busted but I survived, virtual miles away from my goal. Without the potential for quick travel, I’m forced to either walk or search for a vehicle, assuming of course I don’t die on the way. How not fun. In the case of Grand Theft Auto, I find myself distracted. In the midst of a story I’m enjoying, I clip a cop car and set off a massive chase. By the time I escape (or die), the energy generated from the narrative is lost on me. Red Dead Redemption was similar to Far Cry 3: My horse went off a cliff and I was left in the middle of nowhere. In the mix of the story, none of these events make sense, and fast travel direct to missions would be a boon to this genre. Far Cry 3 has great shooting mechanics. They’re arguably the cleanest of the series so far. I experience them in the one mission I managed to complete after endless tutorial pop-ups and the eventual wreck. You can call me impatient. Maybe I am, but I also don’t find the possibility of not being able to continue the story or walking for 20 minutes all that thrilling either. When I sit down to play a game, I don’t want to find the game. I want the developers to tell me their story, show me their world as they intended and they see it. Open world games to me are equal to a director of a movie expecting the audience to fast forward through hours of content to find the crux of the story. So much of these games are endless, pointless filler. They’re not 20 hours long so much as they are 10 because the endless wandering isn’t gameplay to me. I suppose there’s the argument that the world is the story. The plants, the wildlife, the mixing, and the interaction. But, in that case, how much will I miss? How much will I never see? How do I know where I should be to experience everything? When I play Halo 4, I know what I’m experiencing is exactly what 343 Industries meant for me to see. Their world is completed around me. In the interest of fairness, I also don’t like the idea of closing off narrative elements to hidden items. It’s too crucial, and Halo 4 is a victim of that side category. There’s a lot to be said for linearity, positive or negative. However, the one thing I know as I run through a more traditional experience is that I’m on the right path and doing the correct thing. So uncontrolled are open world games, I even question myself and whether or not I’m approaching the mission with the proper methodology. Will I miss something crucial if I run away? If I attack from the wrong direction, will I pass on a funny conversation? How many small details or pieces am I losing if I wander outside the main path? The work that goes into creating these worlds, their locations, and their look is marvelous, which makes missing elements as I walk around all the more depressing. I don’t like missing things as much as I don’t like walking to an island a dozen miles out.